The hot topic of conversation around the physician lounge this morning was the Apple announcement about integrating EHR records into its Health app beginning with the iOS 11.3 beta. My physician colleagues are almost universally iPhone users, with many having Apple watches. There are some big-name hospitals and health centers involved, including Johns Hopkins Medicine, Rush University Medical Center, and Cedars-Sinai. There are a number of tantalizing articles about the solution, promising that records from different organizations will be integrated into a single view. It sounds largely like C-CDA data, including allergies, medications, diagnoses / problems, immunizations, lab results, procedures, and vitals. I didn’t see any mention of visit notes or diagnostic testing reports. Apple’s COO Jeff Williams said that, “By empowering customers to see their overall health, we hope to help customers better understand their health and help them lead healthier lives.” Speaking as a clinician, there’s a significant leap between viewing data elements and truly understanding how they relate to overall health. It will be interesting to see how Apple displays laboratory results, including flagging and trending – it’s hard to tell from the screenshots I’ve seen. Hopefully they’ll integrate educational resources either from the patient portals they’re pulling data from or from other reputable sources. 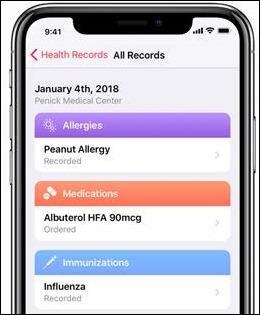 I agree that having health data on your iPhone might be a tool to make people aware of what’s in their medical charts, but many patients are going to need time with a clinician, health coach, or other health advocate to make sense of some of it. Clinicians beware: many more patients may be seeing their data, so it’s time to get those diagnoses and medication lists cleaned up. Just when you think things can’t get any wilder with CMS, some portion of a rule or requirement jumps up to remind you there is always something more mind-numbingly tedious on the horizon for clinicians. This time it’s the CMS Patient Relationship Categories and Codes, created under the CMS Quality Payment Program. Although CMS frequently says it aims to “minimize the burden of participation” and to enhance “clinician experience through flexible and transparent program design and interactions with easy-to-use program tools,” they always seem to come up with something that adds clicks to our workflows with questionable return on investment. Flying in under the MACRA radar was a subsection on “Collaborating with the Physician, Practitioner, and Other Stakeholder Communities to Improve Resource User Measurement,” which mandates the creation and use of new sets of codes to be attached to claims. There are care episode and patient condition groups and codes, along with patient relationship categories and codes designed to enable attribution of patients and episodes of care to clinicians acting in different roles. This all boils down to helping further assess the cost of care. The MACRA legislation requires CMS to create a process with clinician and other stakeholders to review proposed codes. The draft list of patient relationship categories and codes was posted on the CMS website in April 2016 and opened to public comment. Clinicians were to be categorized based on their relationship to the patient. Initially there were five groups of clinicians in three relationship categories, broken down by whether they were acute or continuing care, whether they were primary or specialty care, or whether a consulting provider was involved. I’m not finding a lot of communication from CMS about the codes to help me with my learning curve, but there’s always a possibility I missed it among the dozens if not hundreds of requirements that physicians are trying to keep track of. I also haven’t received any communication from my EHR vendor as far as classes to learn the workflow to apply the codes and they’re usually very much on top of things like this. Even Google didn’t bring back many current results for something that supposedly went into use less than a month ago. Regardless, I think many physicians have become so inundated with requirements, reporting, and regulations that they start to tune things out. I’ll have to start keeping an eye out for additional instructions. As an urgent care physician in a market that’s short on primary care physicians, I tend to perform services that fall into all of the categories. We’ll have to see when our EHR is ready to handle the new codes and what the real implementation timeline looks like. I’m heading to the clinical trenches for the next three days, in a state with some of the highest influenza rates in the nation. Normally I truly look forward to my patient care days, but I’m dreading this schedule block a bit. I’ll be doing all the handwashing and cough-avoidance that I can and am considering spending the day with a mask on. It’s not an ideal way to see patients, but when 60 percent of the patients coming through the door are there because of flu-like symptoms, it might be worth the inconvenience. We’ve had several of our physicians and quite a few staff end up with the flu, and the recovery times have been long. Here’s to staying healthy as long as you can, or at least until the influenza surge breaks. Got flu? Email me. My questions… Can the patient manually add info to their file? Can they choose which info they want to share? Could they hide diagnoses, medications, etc? I would think providers would be skeptical about the completeness & accuracy of patient-provided info.